Thinking of buying or selling? Call the #1 Brokers, Sandra and Patti Post at (954) 650-3419 or fill out the form below. LE CLUB INTERNATIONAL BREAKS GROUND (September 2, 2000) Now under construction, Le Club International is soon to be a reality. 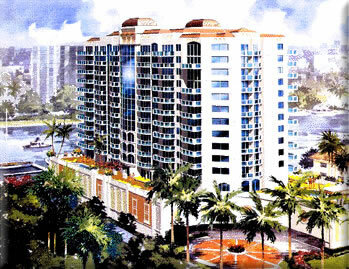 Le Club will offer a lifestyle of luxurious living, fabulous amenities and an environment of upscale proportions. Le Club is unsurpassed in the wide range of amenities it offers to its residents. Imagine the convenience of setting sail at a moment's notice. Le Club International offers residents a private, on-site marina. Providing dockage for up to 150-foot yachts, the marina surrounds the Intracoastal Waterway and the Seabreeze Canal. Residents will have direct access from the building to the marina along a picturesque Water Walk. Landscaped with verdant flora, the walkway will be great for leisurely strolls along the seawall. In addition, Le Club's fourth floor will feature a Pool-Spa and Cabana Plaza overlooking the serene Intracoastal Waterway. Daydreams await you amidst the tropical paradise of rich, exotic vegetation and cascading fountains. A Social Center adjoining the cabana area is designed for special occasions, where residents will have use of an immaculate social area, complete with a convenient catering kitchen. Residents will also find a fully-equipped Fitness Center and Business Center. Le Club's private entry on Birch Road, also shared by the historic Bonnet House, will exude a grandiose display of botanical splendor. Regal Palms will canopy the driveway leading to the majestic, covered gated-entrance rotunda. The Grand Entrance Lobby, complete with Italian marble flooring and handsome wood furnishings, will welcome residents and their guests in palatial style. They can expect to be pampered by a resident manager concierge who will provide them with convenient service at every opportunity. Each resident will receive two side-by-side parking spots, located on the first three floors of the building to assure above ground, covered parking. From 24-hour staffed security to posh private foyers accessible only via owner-activated elevators, residents are assured absolute peace of mind in their sumptuous surroundings. Le Club will provide breathtaking panoramic views of both the Atlantic Ocean and the Intracoastal Waterway, which will be forever protected by the neighboring Bonnet House and the 180-acre Birch State Park. Le Club's fifteen-story condominium tower will sparkle like a jewel amidst the beautiful South Florida skyline. Distinguished in design, this contemporary architectural masterpiece is home to only sixty-six, private ultra-luxury residences. Six spacious floorplans, ranging in size from approximately 2,500 to over 4,400 square feet, include two and three bedrooms, plus den and up to 4 1/2 baths. And for the discriminating few, Le Club also offers an innovative approach to living with their one-of-a-kind "Tower Suites." These 2-story penthouse suites are designed with a vast open layout and an intriguing grand staircase. Expansive floor-to-ceiling windows graciously invite the awe inspiring views of sunrise over the Ocean and sunset over the Intracoastal Waterway. Indulge in the ultimate in privacy and comfort within the master bedroom suite. Complete with separate his/her bathroom suites, both are equipped with elegant marble vanity tops and premium fixtures, including a Jacuzzi whirlpool tub. The spacious suites are adjoined by a large frameless glass shower enclosure. Each residence will include the finest luxuries from around the world. The state-of-the-art kitchen is a gourmet's delight, showcasing stainless steel premium Architectural Series appliances, rich cherry wood Italian cabinetry designed by world-renowned Pinin Farina for Snaidero, with granite countertops and full backsplash. An island workspace and ample countertops facilitate preparation and keep all related items within easy reach. Open to both the living and dining room, this inspiring setting is the ultimate backdrop for entertaining guests in the warmth and richness of Le Club's premier, secluded lifestyle. The properties we deal with require a 3 month minimum stay! Street Address 3300 E. Oakland Park Blvd. Send e-mail to the webmaster with questions or comments about this web site.